Our approach to benefits consulting starts with a thorough assessment of all existing benefit programs in an effort to highlight any inefficient components. 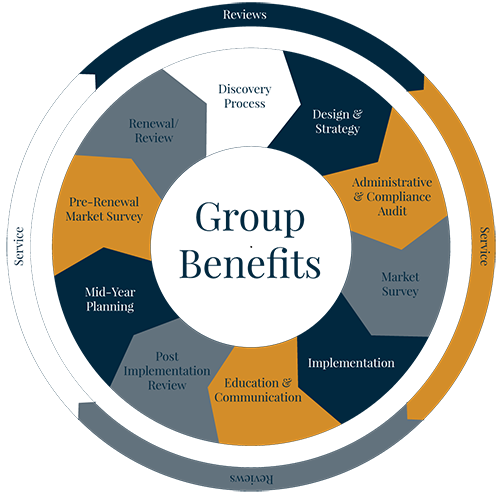 Our evaluation considers historical claim utilization data, demographic information, employee contribution strategy and current benefit plan offerings. Based on our findings, we will tailor a program that meets both the fiscal requirements of our clients as well as the well-being of their employee population. If the core benefits program alone is unable to provide a sustainable solution, our expertise with voluntary benefits allows us the flexibility to implement a properly balanced combination of employer-sponsored core benefits and employee-paid voluntary plans. Our expertise in management of health plan expenses encompasses the continuum of traditional network based managed care plans such as PPO, POS and HMO, to consumer directed programs including HRAs and HSAs for both fully insured and self-funded plans. Our knowledge of the marketplace allows us to identify the most cost-efficient vendors for ancillary services including employer and/or employee paid dental, Life/AD&D and disability. Our Group Benefit Managers are available to help you troubleshoot claims, billing, and enrollment issues. Your dedicated Group Benefits Manager also is able to order any additional supplies you may need, such as enrollment kits, directories, forms, etc. The New Business Department processes the initial paperwork for your group benefits. They will contact you for missing or additional items needed to implement your policy. They will notify you upon approval. Our Renewal Specialists will contact your group 60 to 90 days prior to renewal. They will review your benefits package and inquire if you would like to enhance or change your existing plan upon renewal. They will also find out if there have been any major changes to your company within the last 12 months. Your Group Benefits Consultant will review your needs and shop and compare premium rates and benefit options with the most established insurance carriers. Because we represent every major insurance carrier in the industry, your Benefits Consultant can customize and design a benefits package that is right for you. If you are interested in establishing a 401(k)/Retirement Plan for your company, our 401(k) Specialists will be happy to meet with you. They will take the time to review your options and assist in securing a Retirement Plan that is best suited to your company. Should you or your employees need to look into individual lines of insurance, our Individual Account Representatives are available to answer your questions and compare several insurance plans. These representatives specialize in Individual Health, Life, Disability, and Dental plans. They can also help new or recently terminated employees with setting up a temporary health plan until their new coverage is in force. Voluntary Benefits are typically insurance or insurance related products offered by employers, associations, unions or other multi-member groups, which are traditionally paid for by the employees or members through either payroll-deduction or other group billing formats. The types of programs available grow steadily. The most common are life insurance, short-term and long-term disability, dental, vision, medical supplement, cancer, long term care, intensive-care, and critical care. More recently, the definition has been expanded to include peripheral benefits, such as legal plans, pet-care, and discount health and lifestyle benefits. Many companies can’t afford extensive benefit packages. Voluntary benefit programs enhance an employer’s overall compensation package by making additional affordable protection available on a group basis. Employers have found that insurance is not a "one size fits all" proposition; employees have differing needs, often based on age, family structure, salary levels and a multitude of other variables. A comprehensive voluntary benefits program offers choices. SFA offers a variety of voluntary insurance and ancillary benefits. By offering such benefits, employers can significantly enhance the value of the benefit package offered to their employees without impacting their bottom line. Through our strategic partnership with HR360, SFA is focused on helping employers enhance their organizations and realize their goals by proving human resource strategies, services, programs, solutions and practices. We specialize in HR functional assessments, the design and implementation of compensation programs, HR compliance with federal and state regulations, HR leadership staff augmentation, HR Technology Analysis/Support and leadership training.